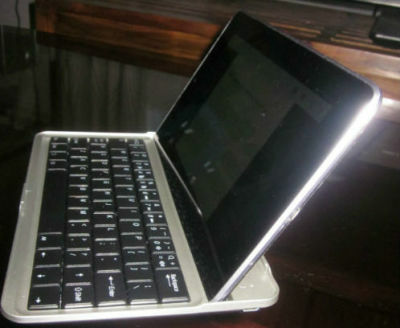 The good folks at MobileZap(AU version of MobileFun.co.uk) sent over a bluetooth keyboard case for my Nexus 7(2012) to review. Currently this is the only hard cover aluminium - clip on - case for the Nexus 7 on the market (though is availble as a few different brands) thats similar to Logitechs offerings for the iPad. Works perfect with the Nexus 7 (2012 version), all normal keys, media, and Android specific keys ‘just work’. The Nexus 7 fits in perfectly in portrait and landscape mode and the case clips on and looks just like the Nexus 7. The bluetooth pairing worked without a hitch and only took a few seconds. Battery life so far seems good, its rechargable via the same USB cable as the Nexus 7. It’s a very minimal design - unlike some of the chunky leather style keyboard cases, making it perfect for when a laptop is too big and a plain tablet to slow for writing. I logged into a linux server via SSH and fired up Vim to see how it would work for coding and its definitely better for coding than any touch/virtual coding keyboards for Android. It’s not as easy to type on as a full size keyboard but for the size it’s as good as I expect. Only issue with using the keyboard in Vim or SSH is the lack of an Escape key, thankfully you can use Ctrl+[ to do the same as Esc in Vim. The backing of this case is hard plastic rather than the soft material the nexus 7 uses. This is great for protecting the Nexus 7 when the case is clipped as a cover but when your using it to type on a hard surface it can slid around as you type. Though easily fixed with a small piece of anti-slip rubber glued on the back. 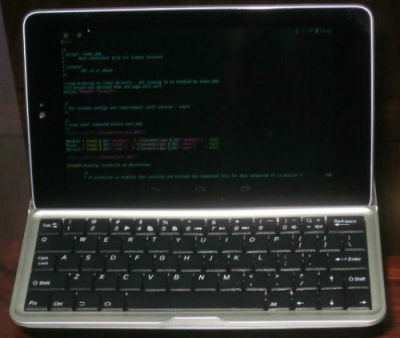 If you need a keyboard for your Nexus 7 for occasional typing - such as taking notes in class or lectures, or writing longer docs and emails this is a great budget keyboard case for the Nexus 7. It’s not going to magically turn your Nexus 7 into a full laptop/desktop replacement but does a great job for when a tablet is more suitable.